(Cooper City, FL) – Jamal Hack, 61, (center) reaches out to thank Broward Sheriff’s Office Deputies Doug Lashbrook (left) and George McCord (right) for saving his life. On May 6th, exactly three weeks to the day, Mr. Hack was discovered on the side of the road by a passing car. The unidentified motorist found Dep. Doug Lashbrook conducting traffic enforcement in the 5100 block of SW 106 Ave. The motorist told Lashbrook there was a person lying on the sidewalk up the street. Dep. Lashbrook radioed in and headed towards the 5800 block of SW 106 Av. Hearing the call, Dep. George McCord, a CPR/AED instructor who recently returned to road patrol after five years in the training unit, also responded. Dep. Lashbrook arrived on scene and found Mr. Hack unconscious and unresponsive on the east side of SW 106 Ave. 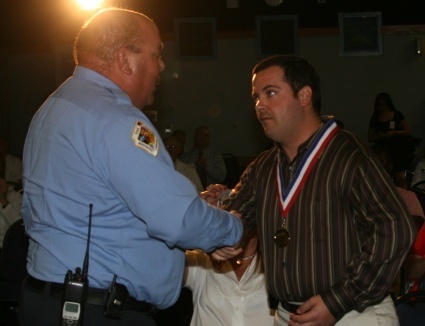 He did not have a pulse, so Lashbrook started CPR while McCord arrived with an Automated External Defibrillator (AED). McCord hooked the patient up to the AED and delivered a shock to the patient, successfully restarting the man’s stopped heart. Broward Sheriff Fire Rescue units from Cooper City Station #28 responded and continued the resuscitation efforts. Mr. Hack was attempting to breathe on his own as he was transported to Memorial Hospital Pembroke, where induced hypothermia, a process to cool the patient to prevent brain damage common with heart attack victims was instituted. Mr. Hack was later transferred to Memorial Regional Hospital in Hollywood where he underwent additional life-saving cardiac procedures. (ADDITIONAL CAPTION INFO): Seated in the second row (L to R): Interim City Mgr. Bruce Loucks, Commissioner Neal deJesus, BSO District Chief John Hale, Dist. Fire Chief Mike Campbell, Dep. Fire Chief Todd LeDuc, Dr. Narendra Upadhyaya, from Memorial Hospital Pembroke who treated Mr. Hack. (Hollywood, FL) – Broward Sheriff’s Office Deputy Maury Hernandez gives a handshake to Broward Sheriff Fire Rescue Inspector Michael Rizzo at Memorial Regional Hospital’s Trauma Awareness Day on Thursday. Rizzo was performing fire inspections just blocks away when Hernandez was critically shot last August. Rizzo, hearing the officer down call, immediately responded and was the first to give aid to Hernandez, who was transported by Broward Sheriff Fire Rescue to Memorial Regional Hospital’s Trauma Center, which is a Level One Trauma Center. Through the years, the talented groups of trauma surgeons, rehabilitation experts and other medical professionals have worked tirelessly to help many survive the most challenging incidents. Over two dozen trauma survivors were recognized, as well as Memorial Regional Hospital’s Trauma Team and members of the community trauma network at the annual event. 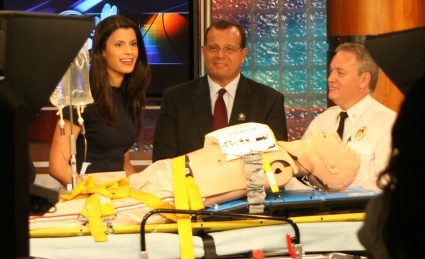 (Miramar, FL) – NBC 6 South Florida Today host Roxanne Vargas is joined by Dr. Nabil El Sanadi, Medical Director and EMS Chief Stephen Krivjanik, of Broward Sheriff Fire Rescue (BSFR) during a segment on EMS week on May 20th. Dr. El Sanadi and Chief Krivjanik highlighted the cutting edge technologies being used by BSFR, including the AutoPulse, a device used in heart attack treatment and hypothermic resuscitation. Broward Sheriff Fire Rescue is the first metropolitan EMS provider in the state and one of only five in the nation to use this method of lowering the body temperature of cardiac arrest patients through intravenous administration of chilled medications. The purpose of the cooling is to prevent brain damage that is common in heart attacks. 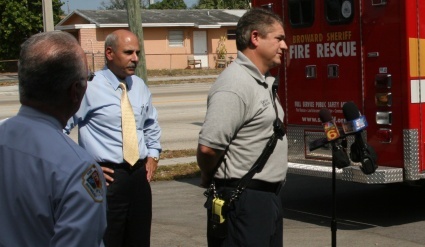 Broward Sheriff Fire Rescue has 15 AutoPulse devices in use, and in its short use has already saved lives. Dr. El Sanadi said, “With these technologies, we are able to see heart attack patients actually walk out of the hospital and return to their families with a normal quality of life.” This is the 35th year EMS Week has been observed in the nation, recognizing the efforts of paramedics, EMTs and fire rescue personnel. It runs from May 18th-24th. Florida Governor Charlie Crist is welcomed to Broward County by Broward Sheriff Fire Rescue Chief of Department Joseph R. Lello (right) and Deputy Chief Todd LeDuc (at left). The Gov. Crist just finished talking with the media and was on his way to speak at the Governor’s Hurricane Conference, held at the Broward County Convention Center Wednesday afternoon. Media from around the southeast are in Broward County all week for the conference. (Ft. Lauderdale, FL) – Broward Sheriff Fire Rescue Capt. 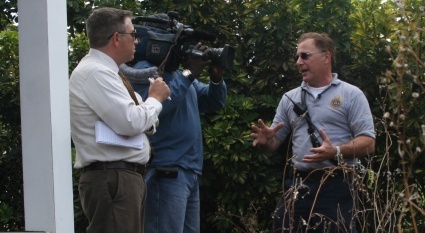 Mark Miceli tells CBS 4 TV reporter Ted Scouten the impact of dry conditions and the potential fire threat in urban areas. Broward Sheriff Fire Rescue is monitoring the Keetch-Byrum Drought index, which was in the 650-700 range in most of central Broward on Wednesday, from I-95 in the east to the Everglades in the west. The conditions are favorable for the occurrence and spread of wildfires. Wind, temperature, relative humidity and atmospheric stability also influence the actual fire danger. 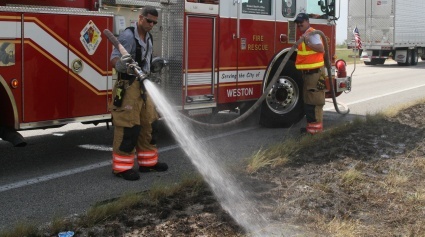 Caption: Broward Sheriff Firefighter Gonzalo Curbelo (left) and Driver/Engineer Jim Harkins douse a hot spot along U.S. 27 Monday.